11 people have been rescued from a block of flats in Southampton after a big fire on the top-floor. 60 firefighters were called to the four-storey building Avon House in York Close in Northam, early this morning. 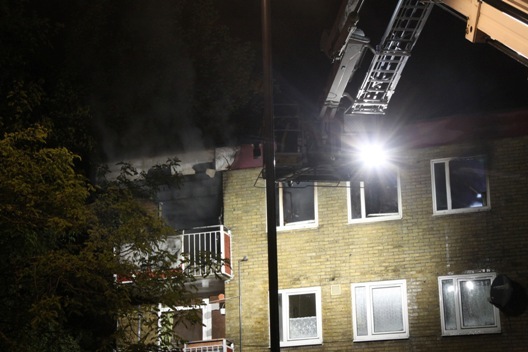 The fire started within a flat on the fourth floor just after 2am. The fire then spread to a communal corridor and neighbouring properties, leaving five people to be rescued by ladders by Hampshire and Fire and Rescue Service crews. Six others were led to safety. "On arrival crews were met with a severe and rapidly developing fire in a top floor flat where multiple rescues were required and aggressive firefighting undertaken. "We would always encourage Hampshire residents to discuss escape routes with those they live with and know what to do in the event of a fire. "In this instance, numerous familes did a fantastic job of getting to a place of fresh air after they realised they could not escape via the communal corridor. Residents had retreated to their balconies after blocking the bottom of their front doors with towels and blankets to stop smoke entering their properties. "We would also urge residents to have working smoke alarms as they can and do save lives. They give you vital warning time to get out, stay out and call us out." Approximately 60 firefighters used 24 breathing apparatus, four jets, one aerial ladder platform, two ladders, and one positive pressure ventialtion fan to tackle the blaze. One flat was 100% affected by fire, one corridor 100% affected by fire, three neighbouring flats 50% affected by smoke and 10% by fire. In total 11 people received treatment on scene from South Central Ambulance Service, with one being taken to hospital as a precaution following smoke inhalation.